Safety is our bottom line. What’s yours? Companies like yours are already using Zonar and experiencing decreased downtime, decreased fuel costs, enhanced safety and improved compliance. See how our customers are doing it. As of Dec. 18, 2017, drivers are required to use an Electronic Logging Devices (ELDs) or Automatic Onboard Recording Devices (AOBRDs) to record hours of service. Our ELD Transition Services Package removes the worry and equips your truck or fleet with a fully compliant ELD solution that’s been FMCSA tested and validated by an independent 3rd party. Fleet Optimization Vehicle tracking, asset utilization, route optimization and more. Safe and Fuel Efficient Driving Speeding, hard-braking, engine idling alerts, driving efficiency and more. 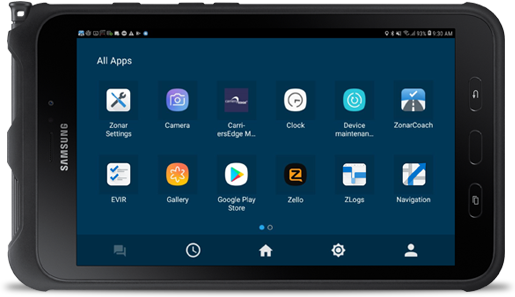 Driver Productivity In-cab driver tablets and applications to assist with every aspect of a driver’s job responsibilities. Compliance Solutions to answer nearly every state and federal requirement including the Electronic Logging Device (ELD) mandate. Verified Pre- and Post-Trip Inspections Patented technology which promotes accountability and consistency for inspections. Systems Integration Integrate data with existing software programs your business already uses. Frost & Sullivan recognizes Zonar with the 2018 North American School and Transit Bus Telematics Company of the Year Award for its comprehensive telematics and inspection solutions in the school and transit bus market.